When first setting up the DM-608/810, there is a recommended order of setting up the processor to achieve maximum performance and benefit from the processor. First things, first. You will need to download the DSP Smart App from our website and install on your computer before you even plug the hardware into power for the first time. This is very very important. You MUST download the software FIRST before connecting the DM-810 to your computer. Please refer to the Knowledgebase article HERE for installation instructions. After the software is installed, you will need to have the software open and running before you connect the DM-810 to your computer via USB. 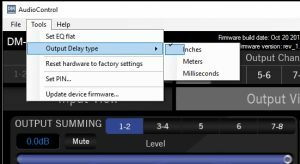 To customize these settings to fit your install, it’s as easy as either moving the slider to get the desired figure, or just typing the crossover frequency directly into the window. 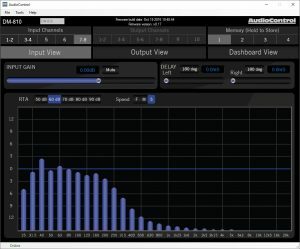 You can also choose between a 12 or 24 db per octave slope. You can also “link” the crossover together for multi-way systems. With the “link” engaged, the high pass filter of one output pair will adjust the low pass filter on the linked output. In the examples below, we’ve linked the 1-2 output with the 3-4 output via the “Link” button. As highlighted by the arrow, they now share the crossover point. By moving that point, it will then be moved on the linked corresponding output channel. After you have set your crossovers up for all of your channels, we will then want to move to input summing. This step is mainly for OEM integration. If you are installing an aftermarket head unit, you can skip this step. One of the great features of the DM-processor is the input and output RTA. 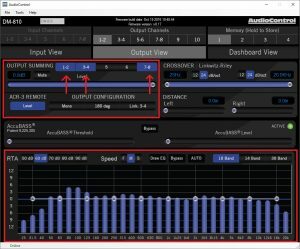 With this feature, you can quickly determine what factory outputs are Highpassed, Lowpassed, or bandpassed so you can quickly and effectively sum channels to create a full range signal. To determine what channels are outputting what frequencies, you would send pink noise thru the factory system. If you do not have a test CD with pink noise, you can download a wav file full of pink noise here. After you have got your crossovers set, and have determined what inputs you need to sum to your output channels, it is time to set gains. The goal of setting the gains is to ensure that no matter the volume level on the head unit, it will be sending the adequate signal thru the processor to the aftermarket amplifiers for the best possible signal. 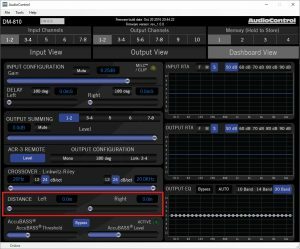 To do this, we will want to set both the input gain and output gain for each channel. 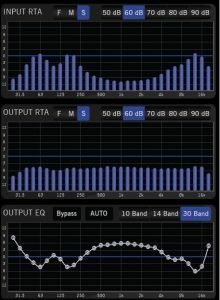 If you have a factory system that bandpasses their channel output, you will want to make sure you send the mid range signal into the 1/2 input. The MILC circuit detects distortion via the mid to low frequencies, so if you send JUST a high frequency signal to the 1/2 input, the MILC will not be able to detect distortion. Once the MILC light turns on, we will then want to back off the volume until the MILC light turns off. Take note of where you are on the volume dial of your head unit. That is the max point you can go before distorting the output of the source head unit. The goal now is to optimize the gains within the DM-810 so you will never need to turn the volume up past this point for maximum volume. The DM-processor has the ability to set delays for every output. 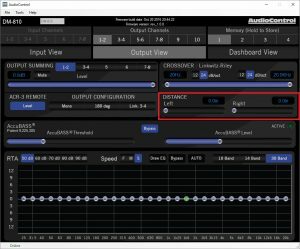 This allows for sweet spot adjustments for left/right, as well as front/back sound stage presentation and woofer/tweeter arrival time alignment. The measurement defaults to inches, but you can choose between inches, meters or Milliseconds via the “tools” drop down menu. To set the output delay, you will want a measuring tape. Measure the distance from each speaker to the chosen sweet spot of the car. (Typically this is the driver’s headrest or center of the listening area). You would then repeat this for each pair of channel outputs. 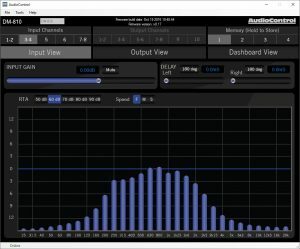 The DM-processor has a great feature called Auto-EQ. It is a great tool for factory integration. 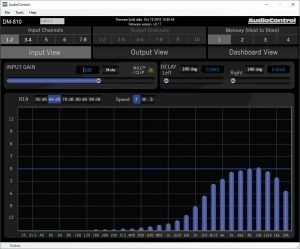 It will quickly and accurately undo the pre-installed EQ curve from a factory system for a flat frequency response. The example below shows the factory system outputting a signal that has a boost both on the high and low end. 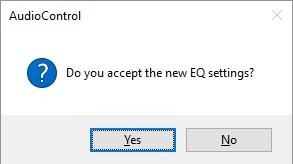 Click “Yes”. 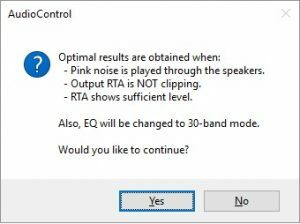 It will then process the EQ. If the overall volume is still not as loud as it could be, you will then adjust the input gains on the amplifier for maximum effect.